Michael Pineda, AL Rookie of the Year? The staff at Fangraphs.com recently voted on all the associated hardware that the Baseball Writers of America will ultimately choose. The runaway choice for American League Rookie of the Year was the M's Michael Pineda (despite the stinker last night). It was interesting that Dustin Ackley didn't get any votes, but as Dave Cameron points out in the post, the voting on the AL ROY is likely to be a pretty interesting one as there are a lot of good candidates and nobody really emerged as the dominant choice. Had Lawrie played in more than 40-odd games, he probably would have been that guy, but hey - maybe Pineda will will have some hardware to show for it. For what it's worth, I also voted for Pineda in the poll. Total homer. Fake hair. No hair. Funny. So now we know that Jack Zduriencik is coming back for another year, and quite honestly I think this is super. In fact, I'd argue that you should extend the guy two more seasons as he executes his plan for the Mariner future -- a future that probably won't include contention in 2012, but hopefully 2013 and beyond. But we'll take the one, and see what the big bald-headed brute can pull off in the off season. With the off-season in mind, I decided to take a look back at the moves Zduriencik has made and consider the outcomes. I'd like to stress that this really isn't a very fair practice -- you do what you can with the information that you have in context of your needs. It's the old 20/20 hindsight bit, but nevertheless, evaluating the trades of a general manager is at the very least, really quite fun. I'm not going to take a heavy saber-mided approach here and badger you with WAR and xFIP and all that, although it would make it a more robust inspection. This has been done before, and done in far greater detail, so I'm not claiming dibs on this -- but it has been on my mind lately, and it seems pretty relevant as we start to think what the M's roster will look like next season, so let's take an extremely quick look at his tenure with the Mariners. December 11, 2008: JJ Putz, Sean Green, Jeremy Reed, Luis Valbuena for Franklin Gutierrez, Endy Chavez, Aaron Heilman, Maikel Cleto, Ezequiel Carrera, Mike Carp, Jason Vargas. A three team deal with the Mets, Indians, and M's all exchanging a bunch of parts and prospects where the big name was Putz. The result was Putz got hurt, Gutierrez put up one of the most incredible defensive seasons in major league history, and Endy Chavez was actually pretty darn good before he got hurt. Then there's Mike Carp, who is just now starting to shed that "AAAA" label, and might just be a useful major leaguer, even a good major leaguer. At .279/.340/.460 (batting average/on base %/slugging), he has really been pretty terrific -- and since his latest recall, he's been crushing the ball. These stats don't stabilize much over such few AB's, so we need more of a sample size, but Mike Carp could turn out to be the gem of the bunch. Gotta love it when you beat Theo Epstein. Aardsma was a good closer for a couple seasons before getting shut down with a variety of ailments, he should be useful in 2012 if he can get healthy. Williamson is in the minors with the A's now, and hasn't been good at all. At the time, it seemed like a really good deal, and now it's just a who-cares deal. Cedeno was awful for the Mariners, and has subsequently been a decent shortstop for the Pirates and Garrett Olson never panned out and is now in the Pirates minor league system where he continues to demonstrate that he can get only minor leaguers out. Chris Burke has to feel a little like a whore. He's no longer in baseball. June 28, 2009: Mike Morse for Ryan Langerhans. 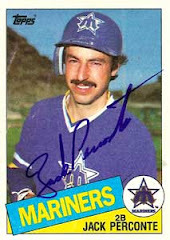 Widely celebrated at the time, Morse had no future with the Mariners and the Mariners needed a warm body to play defense in left field. But whoooooo-boy would we like to claim takesy-backsies on this one. Still not a good defensive player at any position, Morse is raking in Washington to the tune of .311/.366/556 with 26 HR and 82 RBI in 127 games played. Ouchy. Ridding the organization of the lazy shortstop, the M's picked up a flame throwing Cortes, who has been up and down this year, but constantly having the "future closer" bumper sticker slapped on him. Cortes has struggled mightily with his control this season, but it's hard to teach kids to throw 98 and he's still got the pedigree of a very good reliever. Saito is sitting in rookie league ball still. He might be hurt, I can't tell, and frankly it doesn't really matter. A reliever with some upside, Souza is getting hammered in AAA in the Athletics system and Hannahan is keeping a seat warm for a kid by the name of Lonnie Chisenhall in Cleveland. July 29, 2009: Jeff Clement, Nathan Adcock, Ronny Cedeno, Brett Lorin and Aaron Pribanic for Jack Wilson and Ian Snell. The latter part of that deal is pretty easy to sum up. Both players disappointed. Ian Snell defined disappointment while Jack Wilson endeared himself to nobody. Wilson now gets a shot at the playoffs with the Braves. Clement was awful in Pittsburgh and finds himself in AAA. Adcock is now with the Royals, mostly as a reliever, pitching, well, meh. Lorin is a huge chap at 6' 7" but he's still at high A ball, where he's pitching pretty well. Pribanic is a no-strikeout control kind of pitcher, at AA with the Pirates, and pitching pretty well. Cedeno we've talked about already. I don't think anyone wins this deal, it was a batch of prospects for a bucket of veterans and hope and the latter flopped while the book remains open on a couple of the kids. July 29, 2009: Wladimir Balentien for Robert Manuel. Wlad continues to crush minor league pitching and continues to look totally confused by major league pitchers. He's at AAA with the Reds. Manuel was claimed off waivers by the Red Sox last year. He's no longer in baseball. After being downright magical for the Mariners, Washburn was terrible for Detroit and hasn't pitched since the 2009 season. French is in AAA sucking. Robles had a ton of upside. Had. He's been bad since coming back from elbow surgery. He's young and still has a good arm, but probably a lefty specialist reliever at best. Sigh... he was supposed to be the real gem of that deal. Flores is in high A ball for Milwaukee and has been okay, but he's 27 and they don't usually save the minors for right handed decent older dudes. Bill Hall was a nice idea, but wasn't very good for the Mariners. Jack then flipped him to the Red Sox for Casey Kotchman and Hall revived his career with a great season and signed as a free agent with Houston, where he once again wasn't very good and got flipped to San Francisco. And then there's Kotchman, who stunk it up in Seattle and then revived his career with Tampa Bay. Man, now I'm getting irritated. I did a retrospective on the Cliff Lee deal a while back so I won't re-hash. I'll say this though, Aumont has a K/9 rate of 14.69 at AAA and the conversion to reliever seems like it's going pretty well now. But yeah, this deal was ridiculous. Something about Burkes. We like to buy and sell them. He was catching insurance, we sold him to Washington, and he's now out of baseball. A disaster all around. Just a friggin train wreck of bad contracts, bad attitudes, and bad performance. Carlos Silva is currently getting checks from the Cubs and the Mariners to the tune of $12.75 million dollars in order to pitch for the AAA affiliate of the Yankees. I honestly would like to see him called up so he and Bartolo Colon could pose for the fattest-two-starters-on-the-same-team-in-history pictures. Honestly, that'd be about 600 lbs. of meat on two heads. Sigh. Yeah, League was an all-star this season and was an all around great closer. But this team could use a Brandon Morrow in the rotation not only this season, but more importantly going forward. Felix, Pineda, Morrow would have given the Mariners three young great arms. As it stands, with the trade of Fister, there are a lot of problems in this rotation in 2012 unless Paxton, Hultzen, and Walker are truly ready for the show. Chavez had a tremendous 2010 season and followed that up with a pretty big flop this year. Young and raw and all that, but his ability to make contact needs serious work. And last I checked, making contact was the general idea of hitting. Already discussed. Casey Kotchman was worse than Jose Vidro. Nothing much to see here. Branyan wasn't very good, and the move barely made any sense. Diaz isn't much to get excited about. Already discussed Carrera. July 9, 2010: Cliff Lee and Mark Lowe for Justin Smoak, Blake Beavan, Josh Lueke, Matt Lawson. Splash. It was a good haul, who knows if Jesus Montero was a better fit for the team, but this is definitely a wait-and-see kind of trade. Smoak has all the potential in the world, but flashed his hitting talent in fits and spurts. Beavan is a control artist who is a back-end of the rotation kind of guy at best. Lueke has a plus arm and ought to be in the bullpen to start 2012. Lawson is now with the Indians. And Cliff Lee continues to be one of the best pitchers in baseball, but his future was never in Seattle. Lopez fizzled out with the M's, and is now with the Marlins where he's actually playing okay. Roe still has some life left in him despite having pretty awful counting stats this season (no wins and a 6+ ERA). His K rate is up to 7.5 per 9 IP this year and he's been pretty unlucky in terms of stranding runners and batted balls. We'll see if he can become something useful. July 30, 2011: Doug Fister and David Pauley for Casper Wells, Francisco Martinez, Charlie Furbush, and (later) Chance Ruffin. Will have to wait and see how this one plays out. M's needed offense and they got a little in Wells who is having a decent debut for the M's thus far. He's also a pretty good defender. Martinez will be the wildcard in this deal -- a lot of people view him as the 3b of the future. Furbush is a back end starter. Ruffin should lock down a slot in the bullpen in 2012. M's will miss Fister though. A way better haul than I ever thought we'd get for Bedard, Robinson could be the future centerfielder for the M's for years. He was hitting the snot out of the ball in AAA with the Dodgers and he's actually flashed a pretty good bat with the M's thus far. He's got some strikeout problems which will impact his batting average, but he has decent power and good speed, and while he has work to do in the outfield, he's regarded as having good potential as a defender (sans arm). Chiang rather came out of nowhere to post a .340/.402/.648 line with 18 home runs with the Red Sox AA affiliate. In 32 games with the M's AA squad, he's been just completely lost though. So who knows. Oh, and then he traded Jack Wilson to the Braves - who cares, right? There you have it - I may have missed something, so let me know. But on the trade front, I'd say that Jack Z is pretty shrewd. There's really only one stinker in there, and it doesn't even stink all that bad, plus one that might leave a bad taste in your mouth when you visit Toronto. Bill Bavasi had so many stinkers, it was like being hot-boxed by Aunt Fannie. The recent deals are going to need to pay off pretty quickly for the M's to contend in 2012, which is probably asking too much -- but I have a feeling that we're not through talking about the trades that Jack makes. The free agent market ain't too exciting and if he's going to shake up this roster, it's probably going to come via trade. I give the big guy a B+.